Marine manufacturer Harland and Wolff (H&W), based in Northern Ireland, has been chosen by jacket foundation supplier ST3 Offshore sp z o.o. 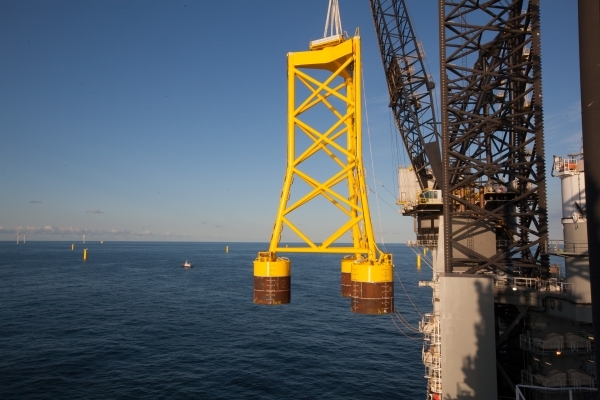 to supply suction buckets for DONG Energy’s Borkum Riffgrund 2, an offshore windfarm being built off the German coast. The 56 turbine windfarm will use two types of steel foundations, suction bucket jackets and monopiles. The innovative suction bucket design consists of three legs welded together in a jacket structure, standing on top of three giant suction buckets anchoring the foundation to the seabed. ST3 Offshore, a leading European serial manufacturer of offshore steel foundations, is to fabricate 20 suction bucket jackets for the Borkum Riffgrund 2 offshore windfarm. As part of this agreement, H&W will manufacture and export a significant number of suction buckets – supporting up to 80 jobs in Belfast. The suction buckets manufactured by H&W will be exported from the UK to ST3’s advanced serial manufacturing plant in Stettin, Poland, for fitting prior to foundation installation in the German Bight (North Sea) during 2018.